A Banksy artwork which appeared on a garage in Port Talbot will be part of an international street art museum in the town, the work's owner has said.John Brandler, who purchased Season's Greeting's for a "six-figure sum" in January, will display the work in a new gallery in the centre of the town. He said the facility, which will feature work from around the world, will open later this year. Deputy culture minister Lord Dafydd Elis-Thomas confirmed the move. Mr Brandler said the museum, called SAM (Street Art Museum), will be just the sixth of its kind in the world and the first in the UK. It will be located at a recently renovated building in Ty'r Orsaf, opposite Port Talbot Parkway railway station. He said: "It's going to be an international museum of street art. I'm talking to a couple of other artists who are among the same level as Banksy. "The aim is to get people off the motorway and into the town, spending money. "He estimates 100,000 to 150,000 people will visit the museum every year. The museum will feature Season's Greetings and other works by Banksy, as well as pieces from Swansea-based street artist Pure Evil and French graffiti artist Blek le Rat. Mr Brandler said the work will remain in the town for at least three years and the museum will be free to local people and under-16s, but tourists will pay to see the collection. "Banksy gave this piece to Port Talbot so people who live here don't have to pay to go to see it," he said. "The idea is that tourists pay and then the money will be split between the museum, council and local charities." He added the piece would "not have stood the passage of time" if it had remained in its original location - on steelworker Ian Lewis's garage in the Taibach area of the town. The move was confirmed in a letter from Lord Elis-Thomas to Bethan Sayed AM on Tuesday, saying the move to the town centre was the "preferred option" of the Welsh Government.He estimated it will take about five weeks to move the work to its new home in the town centre. 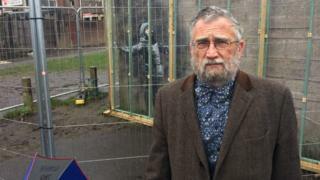 Neath Port Talbot council has been asked to comment.As many as 20,000 people visited the work on Mr Lewis's garage after it was painted in December, before it was bought by Mr Brandler a month later. » Did Banksy paint Llanelli rat on charity shop wall?